The FREE FileTime fax service enables you to quickly take of care of service of documents you are not able to eServe counsel for the case. FileTime will preface the service document(s) with a TRCP compliant cover letter. FileTime will also provide you with an email notifying you of the status of the fax service. Fax service is provided free when your firm is on a FileTime pay per submission plan. You may fax an unlimited number of pages on our Platinum plan ($3.99 per submission) and up to 100 pages per submission on our Gold plan ($2.99 per submission). 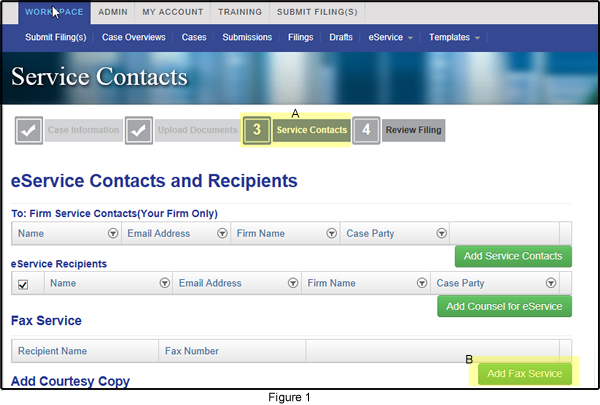 When you arrive at page three of the eFiling submission process you will be on the Service Contacts page (Figure 1 A). Click the Add Fax Service button (Figure 1, B). FileTime takes you to the Add Fax Service page (Figure 2). Enter the Recipient Name (Figure 2, A) and the Fax Number (Figure 2, B). 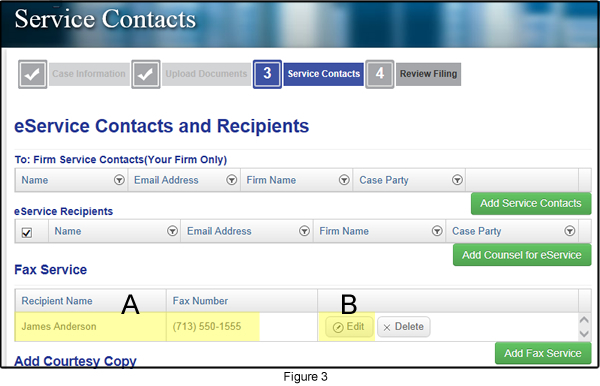 Click the Save and Add New button (Figure 2, C) to add another fax service recipient. Click the Save and Close button (Figure 2, D) after you have added your last fax service recipient. You return to the Service Contacts page (Figure 3) with the name(s) (Figure 3, A) and fax number(s) (Figure 3, B) displayed for any fax service(s) you requested.